Gin is made to be mixed. Its bright botanicals, ranging from herbaceous to spicy to floral and fruity, come to life in the cocktails that they’re shaken and stirred in. It’s no wonder, then, that so many of us opt for newfangled creations that make this spirit, with juniper at its heart, shine. In this month’s Drink List, we’ve rounded up some exciting concoctions for days when you desire something a little more playful than the trusty G&T. We head across the waters to the 28th floor of The Peninsula Hong Kong to find Felix’s new mixologist Marko Petrovic taking the helm at the newly launched cocktail bar. 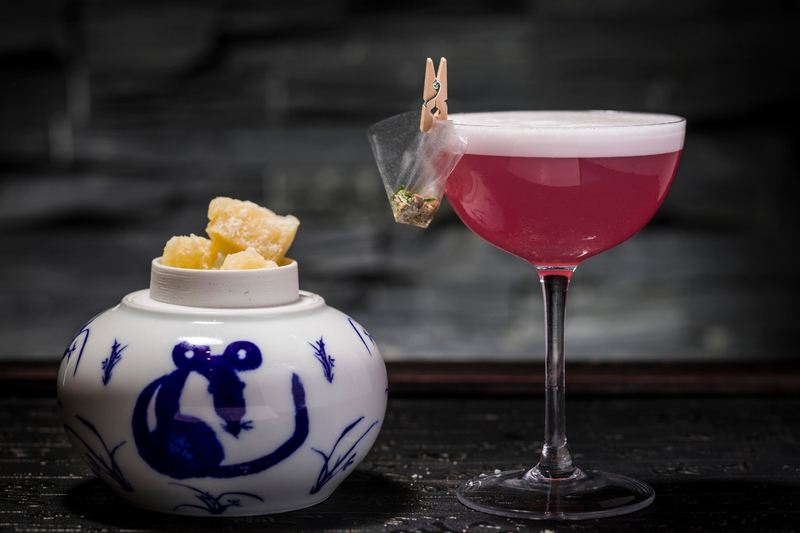 Petrovic brings a whole host of fine creations to enjoy while you take in Hong Kong’s stunning skyline, including an homage to the so-called ‘dark side’ of the city, the Kowloon Sour. Quite the opposite of its name, the cocktail is bright and refreshing. Made with Plymouth Gin, which known for its earthy and citrus tones, it’s then mingled with Dubonnet and a beetroot mix with pepper cordial — lending a rather catching cerise hue to the cocktail. Occupying a familiar underground space on Ice House Street is newly opened late-night lounge Mudita, where you had us at live music and curated cocktails. One such cocktail reeling us in is the Dagaze South Side, which is made with Gin Lane 1751’s ‘Victoria’ Pink. This blush-coloured, refreshing spirit is accented with a hint of spiced bitters and balanced with zesty bergamot juice and oolong tea syrup. It’s a smooth start with this easy-to-drink cocktail, which will continue to go down easily all night. If you ever need help in picking your poison, maybe you could choose a drink that reflects your Chinese zodiac. Why not, when Asian restaurant and bar Fang Fang is offering a new cocktail menu to suit your sign. From the Year of the Dragon or Dog, there’s something for everybody — but for the gin lovers, it has to be Fly Me Mediterranean or the Year of the Rat cocktail. Winner of the 2018 Gin Mare Mediterranean Inspirations competition in Hong Kong, this curious cocktail is both tangy and creamy, blending a parmesan-washed gin with sakura sake, white cacao, bergamot and popping candy. We often hear the phrase ‘East meets West’ in every corner of Hong Kong, but nowhere offers that as much as The Dispensary, a stylish new lounge bar in Tai Kwun that sits between Aqua Restaurant Group’s trio of venues where East (The Chinese Library) truly meets West (British restaurant Statement). Even the bar menu holds two sections for both sides, and the one that has caught our eye is The Crown. Inspired by readings of Her Majesty’s fondness of carrot juice, this fresh and rather healthy-tasting drink uses Tanqueray Gin and is shaken with Campari, rhubarb cordial, lemon, carrot juice and a dash of Peychaud’s Bitters. The Wise King is a bar inspired by the 13th-century monarch Alfonso X of Castille, who (as the legend goes) practically invented tapas. Due to an illness, the king was ordered by doctors to sip on wine regularly and he would do so with small servings of food. Thereafter, he issued a royal decree that all wine should be accompanied by small snacks and thus drinking with tapas was born. In honour of this story, the bar offers exactly this, and what a decadent drinks list they hold. We’re sipping on the barrel-aged cocktail Joya, a pour of Jodhpur, the London dry gin inspired by India, mixed with pomace herbal brandy liqueur, Mancino Rosso and orange bitters.